2017, a big challenge : The CSAT had become qualifying from 2015, was manageable in 2016, and so many were relaxed about it. That could be a mistake in case you took it very lightly. This paper was not easy at all! Lesson : Even for qualifying tests, you need to prepare. Aptitude a must : You had to be either very good at reading comprehension (Hindi or English, not only English), or at basic Maths and Reasoning. If you struggle with both, this paper would be a sure nightmare. Lesson : Basic aptitude is a must. Keep developing it continuously. 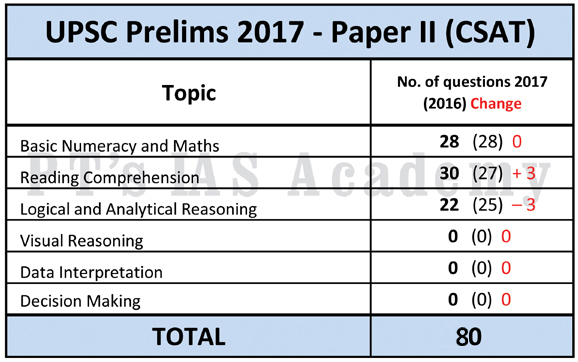 No major change in structure of Test : The distribution of questions across topics was – 28 questions on Mathematics and Basic Numeracy, 30 questions on Reading Comprehension and 22 questions on Logical and Analytical Reasoning. Last year it was 28, 27, 25 respectively. Reading Comprehension : The RC questions (mirror copy in English and Hindi) were excellent! Overall 30 questions spread over 29 passages (last year it was 27 spread over 17). That made sure that only the readers with reasonable speed could perform. But many options were tricky, especially in the “implied” questions. Questions were from all hot topics we read daily as part of our preparations! Care was taken to insert English words in Hindi passages to tone down the toughness of technical Hindi, for Hindi students. Overall 30 questions spread over 29 passages (all small size). Maths not easy : Strangely, Maths was not easy, and even the arithmetic type questions required some work. For the complete maths-haters & / or non-Maths students, it could be a problem. Sitters were not more than 5. Logical and Analytical Reasoning needed some thought : While some relations based questions were not tough, the sets of 3 were not easy. The CSAT paper 2017 was Tough, looking at the sheer number of RC passages, and the nature of Maths questions. RC passages were very clearly focused on three themes – (1) Ecology and environment (including agriculture and food related issues), (2) Governance and its problems (reflecting the approach of the present government), and (3) Cleanliness, Issues of Justice, Right and Duties, Polity etc. An air quality index (AQI) is a way to combine measurements of multiple air pollutants into a single number or rating. This index is ideally kept constantly updated and available in different places. The AQI is most useful when lots of pollution data are being gathered and when pollution levels are normally, but not always, low. In such cases, if pollution levels spike for a few days, the public can quickly take preventive action (like staying indoors) in response to an air quality warning. Unfortunately, that is not urban India. Pollution levels in many large Indian cities are so high that they remain well above any health or regulatory standard for large part of the year. If our index stays in the Red/Dangerous' region day after day, there is not much any one can do, other than getting used to ignoring it. 1. Which among the following is the most logical and rational inference that can be made from the above passage? Our governments are not responsible enough to keep our cities pollution free. There is absolutely no need for air quality indices in our country. Air quality index is not helpful to the residents of many of our large cities. In every city, public awareness about pollution problems should increase. Productive jobs are vital for growth and a good lob is the best form of inclusion. More than half of our population depends on agriculture, but the experience of other countries suggests that the number of . people dependent on agriculture will have to shrink if per capita incomes in agriculture are to go up substantially. While industry is creating jobs, too many such jobs are low-productivity non-contractual jobs in the unorganized sector, offering low incomes, little protection, and no benefits. Service jobs are relatively of high productivity, but employment growth in services has been slow in recent years. 2. Which among the following is the most logical and rational inference that can be made from the above passage? We must create conditions for the faster growth of highly productive service jobs to ensure employment growth and inclusion. We must shift the farm workers to the highly productive manufacturing and service sectors to ensure the economic growth and inclusion. We must create conditions for the faster growth of productive jobs outside of agriculture even while improving the productivity of agriculture. We must emphasize the cultivation of high-yielding hybrid varieties and genetically modified crops to increase the per capita income in agriculture. Sol. Ans (c) “Productive jobs are vital for growth …”. Question based on a hot topic – Jobs! We are asked to find the most logical and rational inference. Option (a) sounds good, but the passage gives a matter of fact situation that service jobs are not growing fast. Option (b) is wrong as such jobs are low productivity in India, not high. Option (c) is the best that can be inferred logically – this is what we should do now as a nation to absorb agri workforce, and improve agriculture itself. Option (d) is wrong, as other nations’ experience suggests otherwise. Best answer is (c). A landscape-scale approach to land use can encourage greater biodiversity outside cdected areas. During hurricane 'Mitch' in 1998, farms using ecoagricultural practices suffered 58 percent, 70 percent and 99 percent less damage in Honduras, Nicaragua and Guatemala, respectively, than farms using conventional techniques. In Costa, vegetative windbreaks and fencerows boosted farmers' income from pasture and coffee while also increasing birdopen in browser PRO version Are you a developer? Try out the HTML to PDF API pdfcrowd.com diversity. Bee pollination is more effective when agricultural fields are closer to natural or seminatural habitat, a finding that matters because 87 percent of the world's 107 leading crops depend on animal pollinators. In Costa Rica, Nicaragua and Colombia silvopastoral systems t tint integrate trees with pastureland are improving the sustainability of cattle production, and diversifying and increasing farmers' income. 3. Which among the following is the most logical and rational inference that can be made from the above passage? Agricultural practices that enhance biodiversity can often increase farm output and reduce the vulnerability to disasters. All the countries of the world should be encouraged to replace ecoagriculture with conventional agriculture. Ecoagriculture should be permitted in protected areas without destroying the biodiversity there. The yield of food crops will be very high if ecoagricultural practices are adopted to cultivate them. Sol. Ans (a) “A landscape based-approach…” Question based on a hot topic – Natural Disasters. We are asked to find the most logical and rational inference. The passage tells us that land use (in farming) must be as per the physical landscape properties, if disaster impacts are to be contained. Interesting! Option (a) is correct, as it says “agri practices that enhance biodiversity can increase output”. Passage also said it, though starting with landscape-based approach that encourages biodiversity, etc. Option (b) is wrong as it’s the reverse of what the passage tells! Option (c) is wrong as the first statement itself talks about “outside protected areas”. Option (d) is wrong as this is not discussed. Best answer is (a). India's GDP displays high value-added and high productivity levels in medium tech and resource processing industries. Promotion of capital and technology intensive manufacturing is not possible in India. India should push up the public investments and encourage the private investments in research and development, technology upgradation and skill development. India has already gained a great share in global markets in sectors showing a rising trend in demand. Sol. Ans (c) “The medium-term challenge for …” Question based on a hot topic – Manufacturing and Make in India! We are asked to find the most logical and rational inference. The passage tells us Indian manufacturing needs to go from low to high in all 3 areas – technology, value and productivity. Option (a) is factually wrong, as per the passage. Medium tech ones are not high value-added ones. Option (b) is wrong as that is what is being suggested! Option (c) is the only one going with the passage. Option (d) is wrong as we are yet to achieve that. Best answer is (c). Over the last decade, Indian agriculture has become more robust with record production of food grains and oilseeds. Increased procurement, consequently, has added huge of food grains in the granaries. India is one of the world's top producers of rice, wheat, milk, fruits and vegetables. India is still home the quarter of all undernourished people in the world. On an average, almost half of the total expenditure of nearly half of the households is on food. Increasing the efficiency of farm to-fork value chain is necessary to reduce the poverty and malnutrition. Increasing the agricultural productivity will automatically eliminate the poverty and malnutrition in India. India's agricultural productivity is already great and it is not necessary to increase it further. Allocation of more funds for social welfare and poverty alleviation programmes will ultimately eliminate the poverty and malnutrition in India. Sol. Ans (a) “Over the last decade, Indian agriculture has …”. Question based on a hot topic – Record agricultural production and associated problems. We are asked to find the most logical and rational inference. The passage tells us that our record production is matched with other negative outcomes. We are asked the most logical corollary (a logic that flows from this logic). Option (a) of course follows, as only then will malnutrition and poverty reduce. Option (b) is wrong, as nothing happens automatically. Option (c) is wrong as “productivity” is not “production”. Option (d) is wrong as it is not mentioned anywhere. Best answer is (a). 6. Which one of the following views corroborates the above statement? A strong Centre and strong States make the federation strong. A strong Centre is a binding force for national integrity. A strong Centre is a hindrance to State autonomy. State autonomy is a prerequisite for a federation. Sol. Ans (b) “The States are like pearls and the Centre…”. Question based on a sensitive topic – Centre-State relations in the Union of India! We are asked to find which option corroborates the statement. The passage tells us that if the Centre grows weak, the Union of India will break! Option (a) is not the idea being discussed. Option (b) is clearly correct. Option (c) is reverse of the idea. Option (d) is not discussed. Hence, best answer is (b). Really I think that the poorest he that is in England has a life to live, as the greatest he, and therefore truly, I think it is clear that every inan that is to live under a government ought first by his own consent to put himself under the government, and I do think that the poorest man in England is not at all bound in a strict sense to that government that he has not had a voice to put himself under. Sol. Ans (b) “Really I think that the poorest he that is in England…” This was difficult to understand in a single reading in English, and referring the Hindi translation would have helped a lot. Anyway. The statement argues for the condition that those who submit to a government must have had their voice while the process (of submitting/surrendering) was on. Hence, options (a), (c) and (d) are wrong, and best answer is (b). 8. The average rainfall in a city for the first four days was recorded to be 0.40 inch. The rainfall on the last two days was in the ratio of 4 : 3. The average of six days was 0.50 inch. What was the rainfall on the fifth day? Also, rainfall of 5th day to 6th day bear a ratio of 4 : 3. So, they will be x(5) = 4x, and x(6)= 3x. Now put equation (1) in equation (2). That gives x(5)+ x(6) = 3 - 1.6 = 1.4 inch. Now put values of x(5) and x(6) according to ratio given. So, 4x + 3x = 1.4. Or, x = 0.2. So x(5) = 4x = 0.8 inch. Answer is (c). 9. Who is specialized in Geography? 10. To which city does the Lecturer specialized in Economics belong? 11. Who of the following belongs to Hyderabad? Now let us see case of A – He/She is not from Hyderabad (given) so only possible places are Mumbai or Kanpur. But the Lecturer from Kanpur is specialized in Geography. So A is from Mumbai (he is specialized in Economics). So, the answer of Q.10 is (b) Mumbai. Now from the remaining subjects : As A-Economics, C-Sociology, F-Commerce, G-Stats, hence only possible subjects are History, Geography and Maths. Now as B is not specialized in either History or Mathematics. He is Specialized in Geography. So answer of Q.9 is (a). Now, A- Mumbai , B-Kanpur (given), C- Delhi, D-Shillong, F-Srinagar, G-Chennai. So the only one remaining is E from Hyderabad. So the answer of Q.11 is (b). 12. In a school, there are five teachers A, B, C, D and E. A and B teach Hindi and English. C and B teach English and Geography. D and A teach Mathematics and Hindi. E and B teach History and French. Who teaches maximum numb, of subjects? Sol. 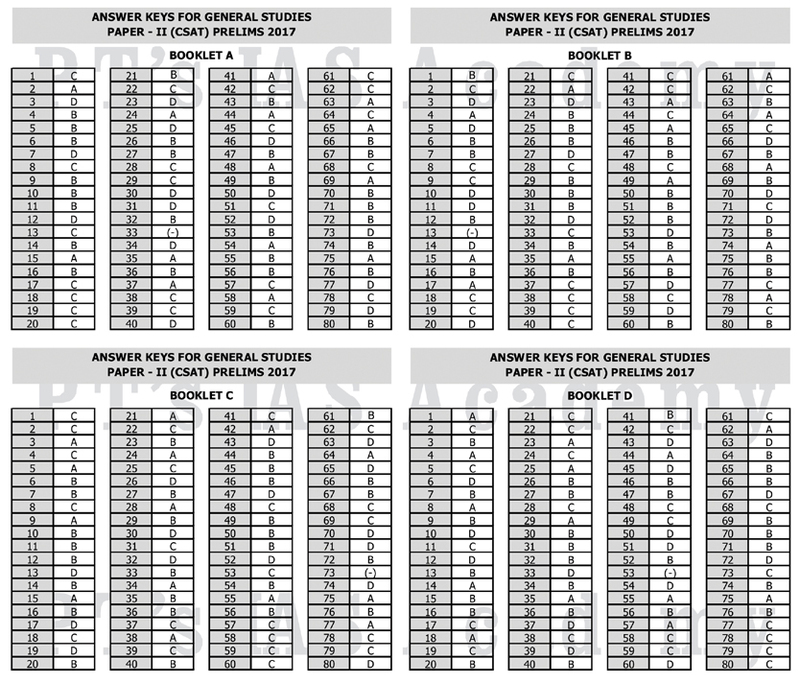 Ans (b) we have to prepare a simple table, as shown below. It is an easy question and can be cracked in a minute. Answer. (b) as B teaches the most subjects! 13. A 2-digit number is reversed. The lamer of the two numbers is divided by It smaller one. What is the largest possible remainder? Sol. Ans (d) Logically, since the largest remaineder is asked, start from option (d). If we get 45 as the remainder it is the final solution (biggest amongst options). Now according to basic mathematics, any number which is a divisor has to be greater than the remainder. So if we want 45 as remainder we need to pick a no greater than 45 (which will be divisor). Correct? So first we will try in the range of 46 to 49. On picking 49 we see that its reverse is 94, and 94/49 gives remainder 45. Hence our answer is 45. Hence option (d). 14. The monthly incomes of X and Y are in the ratio of 4 : 3 and their monthly expenses are in the ratio of 3: 2. However, each saves Rs. 6,000 per month. What is their total monthly income? Sol. Ans (b) Let monthly income of X = 4p, and let then monthly income of Y= 3p (ratio is given 4 : 3). Make sure you don’t take X and Y! Now let monthly expenditure of X= 3q. Then monthly expenditure of Y= 2q. Each of them saves Rs.6000 p/m. Subtracting both equations, we get 4p – 3p – 3q + 2q = 0. We get, p=q. So putting p = q in equation (1), we get, p = q = 6000. Now total monthly income = 4p + 3q = 7p = 7 x 6000 = Rs.42,000. Hence, answer is (b). 15. 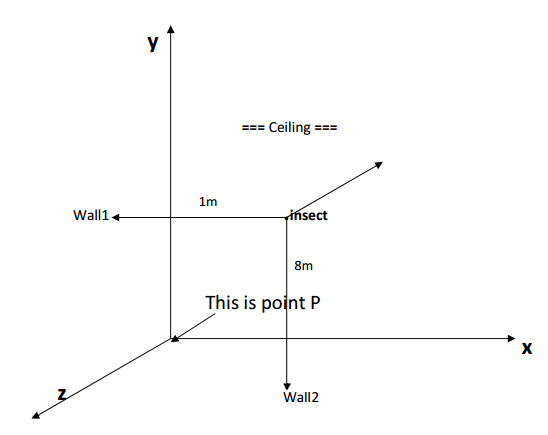 Two walls and a ceiling of a room meet at right angles at a point P. A fly is in the air 1 m from one wall, 8 m from the other wall and 9 m from the point P. How many meters is the fly from the ceiling? Let xy plane be ceiling. So, the yz plane be Wall 1, and the zx plane will be Wall 2. The insect is somewhere in air. Now, distance from Wall1 = 1 m., and distance from Wall2 = 8 m. Also, distance from P = 9 m.
Now let its distance from ceiling be z m.
Square this on both sides, to get : 1 + 64 + z^2 = 81. So z = 4. Hence the distance from the ceiling is 4 metres. Answer.(a). 16. While travelling from C to H, which one of the following stations must be passed through? 17. In how many different ways can a train travel from F to A without passing through any station more than once? 18. If the route between G and C is closed, which one of the following stations need not be passed through while travelling from H to C? Now for Q.16 we have to go from C to H. If we want to leave C there is only one possibility, that is, go to A. Now from A there is only one possibility that is to go to E. So for every travel we have to make from C to H we will pass through E. Answer to Q.16 is (b). Now for Q.17 the following paths are possible : F–D–E–C–A, or F–D–H–G–C–A, or F–D–E–A, or F–D–E–G–C–A. So there are 4 ways of going from F to A without repeating a station. So answer to Q.17 is (d). H–G–E–C and H–G–B–F–D–E–C. So nowhere we have to travel through A. So answer to Q.18 is (c). 19. There are certain 2-digit numbers. The difference between the number and the one obtained on reversing it is always 27. How many such maximum 2-digit numbers are there? Sol. Ans (d) This question is based on basic number theory. Let the numbers be xy and yx. So their values will be (10x + y) and (10y + x). Now (10x + y) – (10y – x) = 27 (given) => 9x – 9y = 27 => x – y = 3. So possible combinations are 9-6, 8-5, 7-4, 6-3, 5-2, 4-1, 3-0. So total number of cases = 7. Hence, answer is (d) – None of the above. 20. What is the total number of digits printed, if a book containing 150 pages is to numbered from 1 to 150? Sol. Ans (b) We have printed from page 1 to 150. This question requires simple addition to solve. Total digits from pages 1 to 9 = 9. Total digits from pages 10 to 99 = 90 x 2 = 180. Total digits from pages 100 to 150 = 51 x 3 = 153. Hence, sum of all digits = 342. Directions for the following 8 (eight) items : Read the following seven passages and answer the items that follow the passages. Your answers to these items should be based on the passages only. 21. Which among the following is the best explation of the above passage? Political development is not a unilinear process for it involves both growth and decay. Traditional societies succeed in resisting positive aspects of political development. It is impossible for traditional societies to break away from lingering loyalties. Sustenance of traditional loyalties is conducive to political development. Sol. Ans (a) “Disruption of traditional institutions…” Question resonating with a hot topic – Class and caste identity in today’s India. We are asked to find the best explanation of the passage. Option (a) is not wrong, but is the best explanation as it talks of both growth (new identities emerging) and decay (old dying). Option (b) is wrong as they do not succeed in doing so always (which is what the option says). Option (c) is wrong due to the word “impossible”. Option (d) is nowhere mentioned or explained. Best answer is (a). There has been a significant trend worldwide towards regionalism in government, resulting in a widespread transfer of powers downwards towards regions and communities since 1990s. This process, which involves the creation of new political entities and bodies at a sub-national level and an increase in their content and powers, is known as devolution. Devolution has been characterized as being made up of three factors—political legitimacy, decentralization of authority and decentralization of resources. Political legitimacy here means a mass demand from below for the decentralization process, which is able to create a political force for it to take place. In many cases, decentralization is initiated by the upper tier of government without sufficient political mobilization for it at the grassroots level, and in such cases the decentralization process often does not fulfil its objectives. 22. Which among the following is the most logical, rational and critical inference that can be made from the above passage? The upper tier of government should impose devolution and decentralization on the regional communities by law or otherwise. Devolution, to be successful, requires a democracy in which there is free expression of the will of the people at lower level and their active participation at the grassroots level. For devolution to take place, a strong feeling of regionalism in the masses is essential. 23. Which among the following is the most logical and essential message conveyed by the above passage? All problems of governance can be solved by using digital technologies. Speaking of digital technologies is speaking of our life and living. Our creativity and imagination cannot be expressed without digital media. Use of digital systems is imperative for the existence of mankind in future. Sol. Ans (b) “We live in digital times. …” This passage is written by someone totally enamoured with all things digital, maybe even some A.I. being! Anyway, let’s try to solve it. The passage speaks of how human beings have become literally one with digital media tools. Without passing a value judgement, it talks about the intense connection between mankind and digital. Hence, the best answer is (b), while options (a), (c) and (d) can be rejected for being unrelated to the passage, too extreme, and too futuristic, respectively. Best answer is (b). The IMF has pointed out that the fast growing economies of Asia face the risk of falling into 'middle-income trap'. It means that average incomes in these countries, which till now have been growing rapidly, will stop growing beyond a point—a point that is well short of incomes in the developed West. The IMF identifies a number of causes of middle-income trap—none of which is surprising—from infrastructure to weak institutions, to leas than favourable macroeconomic conditions. But the broad, overall cause, says IMF, is a collapse in the growth of productivity. 24. Which among the following is the most logical, rational and critical inference that can be made from the above passage? Once a country reaches middle-income stage, it runs the risk of falling productivity which leads to stagnant incomes. Falling into middle-income trap is a general characteristic of fast growing economies. There is no hope at all for emerging Asian economies to sustain the growth momentum. As regards growth of productivity, the performance of Asian economies is not satisfactory. Sol. Ans (a) “The IMF has pointed out that the ….”. This passage is about fast growing Asian economies hitting an income-growth roadblock due to productivity collapse. We have to find the most logical inference. Option (b) is wrong due to a broad generalization being made (“…is a characteristic of fast-growing economies”) whereas the passage is talking of some Asian economies only. Option (c) is extreme, and hence rejected. Option (d) is wrong as not “all Asian economies” are showing productivity problems. Hence, best answer is option (a), though it is worded in a twisted manner that can confuse the cause-effect relationship, but others are definitely not correct. Best answer is (a). 25. Which among the following is the most logical and rational assumption that can be made from the above passage? Innovation and R&D is the only way to reduce rural to urban migration. Every rapidly growing country needs to minimize the divergence between productivity in agriculture and other sectors. Inclusive innovation and R&D can help create an egalitarian society. Rapid urbanization takes place only when a country's economic growth is rapid. Sol. Ans (c) “An innovative India will be ….”. The passage is about innovation in India, and inclusion. This is the biggest challenge for India in the coming decades. We have to find the most logical assumption we can make. Option (a) is wrong it focuses only on rural to urban migration which is not the main issue. Option (b) is not our choice as it is too broad a statement. Option (c) is best, as it focuses on inclusive innovation and R&D for creating an egalitarian society (India). Option (d) is wrong as it even in low growth nations, people can migrate to cities (and that is not the core concern in this question). Best answer is (c). 26. Which among the following is the most logical and rational assumption that can be made from the above passage? The world will not be able to cope with large scale migration of climate refugees. We must find the ways and means to stop further climate change. Climate change will be the most important reason for the migration of people in the future. Relation between climate change and migration is not yet properly understood. Sol. Ans (d) “Climate change is likely to expose a large number …”. The passage is about climate refugees. Option (a) is wrong as it is drawing a final inference (not be able to cope) without adequate information. Option (b) is generically correct but this passage is specifically about climate refugees (and migrants), not stopping climate change. Option (c) is an assumption. Option (d) is the essence of the passage (which can be inferred). Best answer is (d). Synthetic pesticides should never be used in modem agriculture. One of the aims of sustainable agriculture is to ensure minimal ecological imbalance. Botanical pesticides are more effective as compared to synthetic pesticides. Which of the assumptions give above is/are correct? Sol. Ans (b) “Many farmers use synthetic pesticides to kill ….”. Perhaps one of the easiest questions. It talks about the sensitive issue of pesticides, ecological balance and sustainability. Elimination of option technique could help you directly. Statement 1 is extreme – “Synthetic pesticides should never be used in modern agriculture”. This is nowhere mentioned, and we can conclude at the most that its use should be minimized. Hence 1 is wrong. So only option (b) is correct. 28. Which of the following statements is/are correct regarding biopesticides? They are not hazardous to human health. They are persistent in environment. They are essential to maintain the biodiversity of any ecosystem. Sol. Ans (a) “Many farmers use synthetic pesticides to kill ….”. Since statement 1 is present in all option, no point studying it. Statement 2 is wrong (synthetic ones are persistent, not biopesticides). Statement 3 is not correct, as it speaks of “biopesticides” not plants having such properties. So only 1 is correct. So best answer is option (a). All the three digits are different. The number is divisible by 7. The number on reversing the digits is also divisible by 7. Sol. Ans (b) It seems a difficult one indeed, but with some persistence, can be cracked. 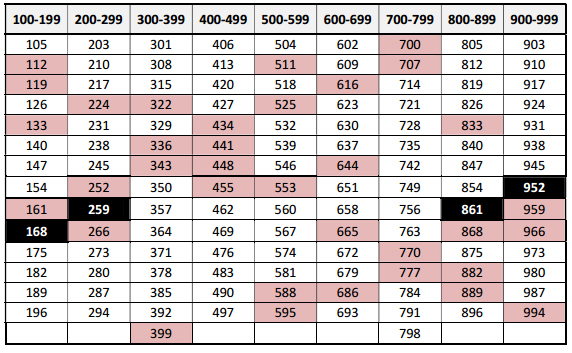 Divide the numbers into those divisible by 7, and falling between successive hundreds, as shown in table. Now, remember, any number that has two similar digits is cancelled out (condition 1). And, when you find the first possible number (in this case 168), then you automatically find the second (reverse of 168, i.e. 861). So we have 2 numbers. Then keep checking and you will find 259 is the next. So 592 is also there. Hence 4 in all so far. You will soon see the pattern that when you check a number, its reverse must be seen in this table itself. So, for example, if you see 427, then its reverse will be 724 and must be in the table. It is not. So 427 anyway can never be a possible solution. Elimination becomes very easy. and the maximum such numbers will be 4 only. Answer is (b). Some colours are not pleasant. Give that statemet 4 is true, what can be definitely concluded? 1 and 2 are true. Sol. Ans (d) A simple logical reasoning question. If some colours are not pleasant (Statement 4), then option (d) i.e. statement 1, that “All colours are pleasant” is definitely wrong. Hence answer is (d). 31. How many numbers arc there between 99 and 1000 such that the digit 8 occupies the units place? Sol. Ans (c) We have to find the numbers in which “8” will occupy the unit’s place. All the numbers will be 3 digit numbers of the form _ _ 8, in which the first place can be filled by 9 ways (by any one of 1,2,3,4,5,6,7,8,9) and the second place can be filled by 10 ways by 10 digits (1,2,3,4,5,6,7,8,9,0). So total number of ways by the principle of counting is 10 x 9 = 90 ways. Hence answer is (c). Sol. Ans (d) A least expected question from basic statistics! When the distribution is Symmetric, it means Mean = Mode = Median. So (a) is wrong. According to Pearson Mode Skewness, if Mode > Median > Mean, then the data is skewed to the left, so in this case it is skewed to the left. So (d) is correct. 33. The age of Mr. X last year was the square of a number and it would be the cube of a number next year. What is the least number of years he must wait for his age to become the cube of a number again? Sol. Ans (b) A not so simple question from “Ages” as part of Algebra. Focus on this year’s age of Mr X first. We should think of a number which on subtracting 1 gives a square number and on adding 1 gives a cube number. It should also be a relevant number as it is the age of a person! Start by recalling the squares and cubes of 1, 2, 3, 4 …. and you will soon find that 26 is such a number. On subtracting 1 it gives 25 (square of 5), and on adding 1 it gives 27 (cube of 3). Now we have to find the least number of years he has to wait for his age to be a cube of a number again. As 27 is 3’s cube, we will have to look at 4’s cube that is 64. So the number of years he has to wait is 64 – 26 (his current age) = 38 years. Hence answer is (b). 34. P works thrice as fast as Q, whereas P and Q together can work four times as fast as R. If P, Q and R together work on a job, in what ratio should they share the earnings? Sol. Ans (a) A nice question from work and time. Let P work with speed 3x, and let Q work with speed x. Now work speed of both p and q taken together = 4x. This is faster than R’s work by 4 times, so R’s work speed = 4x / 4 = x. So now finally P’s speed = 3x, Q’s speed = x, and R’s speed = x. So they should share earnings in the ratio 3 : 1 : 1. Answer is (a). The number of males equals that of females. A and F are sons of F.
D is the mother of two, one boy and one girl. B is the son of A. There is only one married couple in the family at present. A, B and C are all females. A is the husband of D.
E and F are children of D.
D is the daughter of F.
Sol. Ans (b) Given are some family relationships. A and E are sons of F (mother or father). B is the son of A (father, as he is the “son” of F). D is the mother of a boy and a girl. Option (a) is wrong as B is the son. Option (c) is wrong as E and F are not siblings (given). We are left with options (b) and (d). If you assume (b) is correct, then (d) is wrong as A and D won’t be siblings. Hence, our final answer is (b). [ F is the grandmother in the family, whose sons are A and E, and A’s wife is D, and B and C are children of A and D. Females are F, D and C. Males are A, B and E (condition 1) ]. Answer is (b). 36. A bag contains 20 balls. 8 balls are green, 7 are white and 5 are red. What is Hie minimum number of balls that must be picked up from the bag blindfolded (without replacing any of it) to be assured of picking at least one ball of each colour? Sol. Ans (b) A question from basic logic and arrangements. There are 8 balls that are green and 7 that are white. 8 G + 7 W + 5 R =20. Now, if we pick 8 + 7 = 15 balls, there remains a chance that 8/8 are green and 7/7 are white, that is all 15 are green and white. But if we pick 15 + 1 = 16 balls, there cannot be more than 15 balls that are green and white, so we will get at least 1 red ball. So, 16 is the answer when we are sure of picking at least one ball of each colour (G, W, R). Those who are confused, please pay attention to “at least”. So in normal circumstances, we will keep drawing all colours randomly, but in the extreme case of getting only G and W in the first 15 draws (and not R), this solution works. Answer is (b). 37. If 2 boys and 2 girls are to be arranged in a row so that the girls are not next to each other, how many possible arrangements are there? Sol. Ans (c) Simple seating question. Possible cases are – GBBG – 4 cases (as boys and girls can exchange seats within the group making it 2 x 2), BGBG – 4 cases, GBGB – 4 cases, and TOTAL = 4 + 4 + 4 = 12 cases. Hence answer is (c). This question should have been done correctly. 38. The outer surface of a 4 cm x 4 cm x 4 cm cube is painted completely in red. It is sliced parallel to the faces to yield sixty four 1 cm x 1 cm x 1 cm small cubes. How many small cubes do not have painted faces? Sol. Ans (a) A question from basic mensuration and shapes of objects. As we divide a painted cube into 64 smaller cubes, there are 4 layers of cubes formed which have 16 cubes each arranged like a cuboid. Now, the middle 2 cuboids have 4 cubes each which are completely uncoloured, so the correct answer here is 4 + 4 = 8. Hence best answer is (a). This question should have been done correctly. C is to the immediate left of A. D is immediate neighbour of B and F.
G is to the immediate right of D.
A and E are at the extreme ends. Sol. Ans (c) A good question from linear arrangements. Start with the first condition given, and try making the queue. 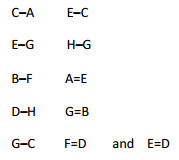 After some hit and try, you will see that the correct arrangement is (from left to right) A–C–B–D–G–F–E–H. First, since A is sixth to the left of E, it can be either A x x x x x E x or it can be x A x x x x x E. Now, since H is sixth to the right of C, it can be either C x x x x x H x or it can be x C x x x x x H. Since F is to the immediate right of G, and neighbor of E, we have G F E. Combining it all together, we get A–C–B–D–G–F–E–H. So check all options and G is to the immediate right of D. Hence, (c) is correct. Sol. Ans (b) Since 2 is in ‘red colour chalk’, so it must mean something from this set. So 2 does not mean white. Similarly 5 is in ‘red colour chalk’ so it couldn’t mean white. Now 8 isn’t in ‘white colour chalk’ so 8 can’t mean white. So only remaining possibility is option (b). What climate change will undeniably do is cause of amplify events that hasten the reduction of resources. Competition over these diminising resources would ensue in the form of political or even violent conflict. Resource based conflicts have rarely been overt and are thus difficult to isolate. Instead they take on veneers that appear more politically palatable. Conflicts over resources like water are often cloaked in the guise of identity or ideology. 41. What does the above passage imply? Resource-based conflicts are always politically motivated. There are no political solutions to resolve environmental and resource based conflicts. Environmental issues contrilaite to resource stresses and politic ril conflict. Political conflict based on identity or ideology cannot be resolved. Sol. Ans (c) “What climate change will undeniably do is cause or amplify …”. The options are very close! Option (a) says that “such conflicts are always politically motivated”. The passage does not say so – it merely says that “… have rarely been overt (open)”. The word rarely does not mean never. Hence, we will reject option (a). Option (b) is again an extreme option as it talks of “there are no political solutions”. That isn’t mentioned hence rejected. Option (c) is correct. Option (d) is an extreme statement not borne out from this limited passage. So rejected. Best answer is (c). Sol. Ans (a) “The man who is perpetually hesitating…”. We are asked to find the keynote (main message). Options (b) and (c) can be eliminated easily. (b) because it is wrong, and (c) as it is too vague. Options (a) and (d) look close. The reason we will choose (a) is because the passage delves in-depth on the issue of suggestions and wavering mind. Hence (a) comes closest as “we should first consult wisely and then resolve firmly” captures that keynote idea. Best answer is (a). During the summer in the Arctic Ocean, sea ice has been melting earlier and faster, and the winter freeze has been coming later. In the last three decades, the extent of summer ice has declined by about 30 per cent. The lengthening period of summer melt threatens to undermine the whole Arctic food web, atop which stand polar bears. 43. Which among the following is the most crucial message conveyed by the above passage? Climate change has caused Arctic summer to be short but temperature to be high. Polar bears can be shifted to South Pole to ensure their survival. Without the presence of polar bears, the food chains in Arctic region will disappear. Climate change poses a threat to the survival of polar bears. Sol. Ans (d) “During the summer in the Arctic ocean…” A question about global warming, Arctic ice reduction and the future of polar bears. Anyone who read regularly, would have anticipated the answer to this one! The most crucial message is obvious – the polar bears will face a true existential threat due to climate change (and Arctic ice reduction etc.). Option (c) makes a big claim, not necessarily true. Option (b) is desirable, but impractical and not mentioned! Option (a) is reverse of what’s being said. Best answer is (d). 44. Which among the following is the most crucial message conveyed by the above passage? The ideas of purity and pollutions are so deep-rooted that they cannot be removed from the minds of the people. People have to perceive toilet use and pit-emptying as clean and not polluting. People cannot change their old habits. People have neither civic sense nor sense of privacy. Sol. Ans (b) “Why do people prefer open defecation …” A question related to Swachch Bharat Abhiyan. The most crucial message conveyed is option (b), as the other 3 options are too negative and reject the possibility of any solution to this pressing social problem. Best answer is (b). In the last two decades, the world's gross domestic product (GDP) has increased 50 percent, whereas inclusive wealth has increased by a mere 6 percent. In recent decades, GDP-driven economic performnce, has only harmed inclusive wealth like human capital; and natural capital like forests, land and water. While the world's human capital which stands at 57 percent of total inclusive wealth grew by only 8 percent, the natural which is 23 percent of total inclusive wealth declined by 30 per cent worldwide in the last two decades. 45. Which of the following is the most crucial inference from the above passage? More emphasis should be laid on the development of natural capital. The growth driven by GDP only is neither desirable nor sustainable. The economic performance of the countries of the world is not satisfactory. The world needs more human capital under the present circumstances. Sol. Ans (b) “In the last two decades …” The passage presents a very gloomy picture of the one-sided chase of economic aspects of GDP, harming the other crucial facets like inclusive wealth, and natural capital. We have to find the most crucial inference. Option (c) is wrong. Options (a) and (d) are not wrong, but are not the key ideas. The key idea is that we have taken the wrong route to prosperity, and only option (b) resonated with that. Answer is (b). By 2020, when the global economy is expected to run short of 56 million young people, India, with its youth surplus of 47 million, could fill the gap. It is in this context that labour reforms are often cited as the way to unlock double-digit growth in India. In 2014, India's labour force was estimated to be about 40 per cent of the population, but 93 per cent of this force was in unorganized sector. Over the last decade, the compound annual growth rate (CAGR) of employment has slowed to 0.5 per cent, with about 14 million jobs created during last year when the labour force increased by about 15 million. 46. Which of the following is most rational inference from the above passage? India must control its population growth so as to reduce its unemployment rate. India is capable of supplying !It, skilled young people to oil, countries. Sol. Ans (b) “By 2020, when the global economy is expected to run short …” A question based on demographic dividend and jobs, the most sensitive challenge for governments now! (although the data presented can be questioned – so many jobs were not generated in reality). Options (a) and (c) get ruled out immediately – (a) because it is beyond the scope of this passage, and (c) as it is an assumption. Option (b) and (d) to be checked. (d) is not the prime focus here, but (b) is – we have to change the labour laws to achieve faster growth. Answer is (b). Sol. Ans (d) “The very first lesson that should be taught to us …”. A philosophical question regarding work and mankind, with very close options. Option (b) is not the main idea, but a final suggestion. Option (a), (c) and (d) are all correct points. But it is only in option (d) that the recurrent theme – "teach kids (when they are old enough to understand it) what is work ... we have to work, mankind cannot run away from work, we will die if we do so, nature does not allow that” – is captured nicely. It will cover the leisure aspect also. Hence, best answer is (d). There is no harm in cultivating habits so long as they are not injurious. Indeed, most of us are little more than bundle of habits. Take away our habbits and the residuum would hardly be worth bothering about. We could not get on without them. They simplify the mechanism of life. They enable us to do a multitude of things automatically, which, if we had to give fresh and original thought to them each time, would make existence an impossible confusion. Sol. Ans (c) “There is no harm in cultivating habits …” A philosophical passage about habits and man. The passage says that man is nothing but all habits taken together. These make life regular and automatic, thereby making it easy to live, which otherwise would be impossible. Hence, option (a) is wrong. Option (b) is not mentioned. Option (d) is not exactly mentioned so (automatically does not always mean “mechanized”, which carries a negative connotation). Best answer is option (c). Directions for the following 2 (two) items: - Consider the given information and answer the two items that follow. No supporters of 'party X', who knew Z and supported his campaign strategy, agreed for the alliance with 'party Y’; but some of them had friends in 'party Y'. 49. With reference to the above information, which one among the following statements must be true? Some supporters of 'party Y' did not agree for the alliance with the `party X'. There is at least one supporter of `party Y' who knew some supporters of 'party X' as a friend. No supporters of 'party X' supported Z's campaign strategy. No supporters of 'party X' knew Z.
Sol. Ans (b) The line “but some of them had friends in ‘party Y’” clearly indicates statement (b) is correct. Best answer is (b). Some supporters of 'party X', who opposed Z's campaign strategy, knew Z.
Sol. Ans (b) Statement 1 is correct. Statement 2 is incorrect because in the passage there is no mention of people who opposed Z’s campaign strategy. Statement 3 is incorrect. Hence, best answer is (b). (note that we are asked the not correct ones). 51. If second and fourth Saturdays and ,all the Sundays are taken as only holidays for an office, what would be the minimum number of possible working days of any month of any year? Sol. Ans (b) Since minimum number of working days is asked, start with the smallest month possible. That would be a February, in a non-leap year, with 28 days in all. So the first day be Sunday, then the 8th, 15th and 22nd will be Sundays as well. For the second and fourth Saturdays, we will have only 14th and 28th. Hence total holidays will be 4 + 2 = 6. Working days = 22. Best answer is (b). 52. If there is a policy that 1/3rd of population of a community has migrated every year from one place, to some other place, what is the leftover population of that community after the sixth year, if there is no further growth in the population during this period? Sol. Ans (d) A question using basic ratio logic. As per the policy, population left after first year= 2/3 of original, as 1/3 has left. Now apply a simple logic using ratio. Population left after second year= [2/3]^2 of original. And so on. So, population left after 6th year= [2/3]^6 of original, which is equal to 64/729 part of the population. Best answer is (d). 53. Four tests—Physics, Chemistry, Mathematics and Biology are to be conducted on four consecutive days, not necessarily in the same order. The Physics test is held before the test which is conducted after Biology. Chemistry is conducted exactly after two tests are held. Which is the last test held? Sol. Ans (c) The correct sequence is Biology – Physics – Chemistry – Mathematics. We solved it using simple hit and trial. Best answer is (c). 54. The sum of income of A and B is more than that of C and D taken together. The sum of income of A and C is the same as that of B and D taken together. Moreover, A earns half as much as the sum of the income of B and D. Whose income is the highest? Sol. Ans (b) A question from Basic Arithmetic. Given that the sum of incomes of A and B is more than that of C and D. So, A + B > C + D. Similarly, A + C = B + D. Also given that A = (B + D)/2, so since A + C is equal to B + D, hence C = (B + D)/2. Substituting values of A and C in terms of B and D, in the equation A + B > C + D, we get : 3B/2 + D/2 > 3D/2 +B/2 Which gives us B > D. So the correct answer is B, option (b). Also note that since A and C are equal, those two options get eliminated anyway. Any guesswork should be only between B and D.
II. Even though one's voice is not good, one can keep practising. Only conclusion I follows from the statement. Only conclusion II follows from the statement. Either conclusion I or conclusion II follows from the statement. Neither couclusion I nor conclusion II follows from the statement. Sol. Ans (a) Let us apply basic logic. Conclusion I definitely follows as that is the main assertion given. Conclusion II is incorrect, as it says “Even though one’s voice is not good, one can keep practicing”. It is an assumption we will be making. Hence best answer is (a). 56. There are three pillars X, Y and Z of different heights. Three spiders A, B and C start to climb on these pillars simultaneously. In one chance, A climbs on X by 6 cm but slips down 1 cm. B climbs on Y by 7 cm but slips down 3 cm. C climbs on Z by 6.5 cm but slips down 2 cm. If each of them requires 40 chances to reach the top of the pillars, what is the height of the shortest pillar? Sol. Ans (b) The basic trick in such climbing and slipping questions is that the last upward jump ends the question, and the last slip is not counted. Let us begin. Spiders A, B and C are climbing up the pillars X, Y and Z. In one climb, A goes up X by 6 cm, and falls by 1 cm. So net in one climb = 5 cm. Similarly, B goes up Y by 7 cm, and falls by 3 cm. So net in one climb = 4 cm, and for C on Z, it is net 4.5 cm in one climb. Given that all three took 40 climbs (chances) and reached the top. So they touched the top in the 40th climb, and we should do the “net” calculation till the 39th for all three. For spider A, in 39 chances it will go up by 5 x 39 cms, B will go up by 4 x 39 cms, and C will go up by 4.5 x 39 cms. Obviously, for spider B, the distance is going to be the smallest. So the total length for pole Y = (4 x 39) + 7 = 163 cms. A common mistake made here is that we simply multiply net distance with 40, which we cannot (as once the spider reaches the top, the question would be solved). Best answer is option (b). 57. "Rights are certain advantageous conditions of social well-being indispensable to the true development of the citizen." Rights aim at individual good only. Rights aim at social good only. Rights aim at both individual and social good. Rights aim at individual good devoid of social well-being. Sol. Ans (c) Just read all the options first, and it becomes clear that except (c), others are absurd. Answer is (c). 58. 15 students failed in a class of 52. After removing the names of failed students, a merit order list has been prepared in which the position of Ramesh is 22nd from the top. What is his position from the bottom? Sol. Ans (c) A question from basic arithmetic. Total students in merit list= 37 (= 52 – 15). Ramesh’s position in these 37 students = 22nd, and so, students behind him= 15 students (37 – 22). So, his position from bottom = 16th (15 + 1). Answer is (c). A - B means A is the wife of B. What does the expression P + R - Q mean? Q is the son of P.
Q is the wife of P.
Q is the father of P.
Sol. Ans (c) P + R means P is son of R. R – Q means R is wife of Q. So (P + R – Q) means Q is the father of P. Answer (c). 60. Gopal bought a cell phone and sold it to Ram at 10% profit. Then Ram wanted to sell it back to Gopal at 10% loss. What will be Gopal's position if he agreed? Sol. Ans (c) A simple question from Profit and Loss. Let original price of phone = Rs 100. Gopal sold at 10% profit. So selling price = Rs.110. Ram agreed to sell at a 10% loss so he will sell for Rs 110 – 10% of 110 = Rs.110 – 11 = Rs 99. So total profit of Gopal = Rs 100 – Rs 99 = Re 1. But this profit was made on his cost price (which is 100). So total % profit= 1 %. Answer is (c). Sol. Ans (b) The author mentions that India is a great nation, with high standards, and the citizens have to live upto those. Now, option (a) is wrong as we cannot exhort citizens to achieve "privileges", though the other part is not wrong. And we have a better option later. Option (b) speaks of the key ideas that the author intends India and Indians to achieve in the long run - equal privileges (what's said in the passage is that all Indians are entitled to it, but do not have it at the moment, hence we have to achieve it), fulfilment of destiny and political tolerance ("we cannot encourage communalism..."). So option (b) is the best. Option (c) talks of goals not disucssed here. So rejected. Option (d) uses words that indicate a means to an end - like "hard work" - and not the end itself. Hence, best answer is (b). "The individual, according to Rousseau, puts his person and all his power in common under the supreme direction of the General Will and in our corporate capacity we receive each member as an indivisible part of the whole." Sol. Ans (c) A small but heavy philosophical one! Option (a) is wrong as the literal sum of all private wills is not General Wills (nowhere mentioned as an arithmetic truth). Option (b) is irrelevant (elections etc.). Option (c) is best – collective good distinct from the private wills. Option (d) is not explicitly mentioned. Best answer is (c). 63. What does the above passage imply? In a democracy, force is the main phenomenon in the actual exercise of sovereignty. In a mature democracy, force to a great extent is the main phenomenon in the actual exercise of sovereignty. In a mature democracy, use of force is irrelevant in the actual exercise of sovereignty. In a mature democracy, force is narrowed down to a marginal phenomenon in the actual exercise of sovereignty. Sol. Ans (d) Theme : Democracy, sovereign power and mature citizens. Option (a) is wrong as the reverse is mentioned. Option (b) too is wrong! So we easily reduce options from 4 to 2. Check (c). It speaks of “irrelevance of force” and (d) talks of “a marginal phenomenon”. Refer passage. It mentions “seldom occurs”. Hence, option (d) narrowly wins over (c). Best answer is (d). A successful democracy depends upon widespread interest and participation in politics, in which voting is an essential part. To deliberately refrain from taking such an interest, and from voting, is a kind of implied anarchy, it is to refuse one's political responsibility while enjoying the benefits of a free political society. Sol. Ans (a) Perhaps one of the easiest questions in this paper! Option (b) is wrong as “refraining from vote” is being discussed. Similarly, (c) is also wrong. We are left with (a) and (d), and the tone of the passage clearly indicates a certain political duty of citizens. Hence, best answer is (a). Sol. Ans (d) Another sitter! You can easily eliminate option (a) as the leader’s ability is foresee his ascent is not being explicitly discussed. Option (b) is factually wrong. Option (c) is not being discussed. Option (d) is clearly mentioned. Best answer is (d). People always see the leisure time as a gift and use it for acquiring more material possessions. Use of leisure by some people to produce new and original things has been the chief source of human progress. Sol. Ans (b) The questions looks long and intimidating, but the statements and options make it a sitter! Statement 1 is wrong due to the word “always” – a generalization. Statement 2 is correct as it is clearly mentioned. Best answer is (b). There is more than a modicum of truth in the assertion that "a working knowledge of ancient history is necessary to the intelligent interpretation of current events". But the sage who uttered these words of wisdom might well have added something on the benefits of studying particularly the famous battles of history for the lessons they contain for those of us who lead or aspire to leadership. Such a study will reveal certain qualities and attributes which enabled the winners to win—and certain deficiemcies which caused the losers to lose and the student will see that the same pattern recurs consistently, again and again, throughout the centuries. A study of the famous battles it history would help us understand the modern warfare. Studying the history is essential fin anyone who aspires to be a leader. Sol. Ans (b) The Statement 1 goes wrong as it talks of “understand modern warfare” whereas the passage does not. Statement 2 is of course correct. Hence best answer is (b). Another very easy question. Now given that average weight of first 5 persons is [ x(1) + x(2) ..... + x(5) ] / 5 = 45. Now subtract both equations 2 and 3 from the 1st equation. It will give x(5) = 50 kg. Answer is (c). 69. In a group of six women, there are four tennis players, four postgraduates in Sociology, one postgraduate in Commerce and three bank employees. Vimala and Kamla are the bank employees while Amala and Komala are unemployed. Komala and Nirmala are among the tennis players. Amala, Kamla, Komala and Nirmala are postgraduates in Sociology of whom two are bank employees. If Shyamala is a postgraduate in Commerce, who among the following is both a tennis player and a bank employee? Sol. Ans (c) It is given that Amala and Komala are unemployed so automatically options (a) and (b) are wrong. Also it is given that Komala and Nirmala are amongst tennis players, so the only possible answer is (c) Nirmala. Best answer is (c). 70. P = (40% of A) + (65% of B) and Q = (50% of A) + (50% of B), where A is greater than B. In this context, which of the following statements is correct? P is greater than Q.
Q is greater than P.
P is equal to Q. None of the above can be concluded with certainty. Sol. Ans (d) The exact relation between A and B is required to find relation between P and Q. As the numerical values of A and B will diverge, the answers will start to change from initial assumptions. Best answer is (d). The two watches show the identical time again on completion of 30 days. The two watches show the identical time again on completion of 90 days. The two watches show the identical time again on completion of 120 days. None of the above statements correct. Sol. Ans (d) A question from clocks, but a logical one. In 1 day (24 hours), first clock gains 2 min and the second loses 2 min. So net gap is 4 minutes per day. It is a 24 hour time format, so the two clocks (which started with showing identical times) will next show identical time when the net gap will become 1 full day (= 24 hours x 60 minutes = 1440 minutes). If 4 minutes are gained per day, then 1440 minutes will be gained in 1440 / 4 = 360 days. Hence, answer is (d). 72. In a city, 12% of households earn less than Rs. 30,000 per year, 6% households earn more than Rs. 2,00,000 per year, 22% households earn more than Rs. 1,00,000 per year and 990 households earn between Rs. 30,000 and Rs. 1,00,000 per year. How many households earn between Rs. 1,00,000 and Rs. 2,00,000 per year? Sol. Ans (b) A good question based on percentages. Total households are 100%, then if 12% are below Rs.30000, X % are between 30,000 and 1,00,000, and 22% are above 1,00,000. So, if we add them, we get : 12 + X + 22 = 100 => X = 66%. This 66% is given to us as 990 households (read question). So the total population = (990 x 100) / 66 = 1500 households. Now 22% of 1500 are above Rs.1,00,000. But 6% are above Rs.2,00,000. So households between Rs.1,00,000 and Rs.2,00,000 are 16% of 1500 ( = 22% - 6%), which is 240. That gives us the answer = 240 households. Best answer is (b). 73. A clock strikes once at 1 o'clock, twice at 2 o'clock and thrice at 3 o'clock, and so on. If it takes 12 seconds to strike at 5 o'clock, what is the time taken by it to strike at 10 o'clock? Sol. Ans (-) Time taken by the clock to strike at 5 o’clock = 12 seconds. Now these 5 strikes took 12 seconds, so that is the time counted for 4 intervals (first strike to second, second to third, third to fourth, fourth to fifth). Hence, for 4 intervals, the time is 12 seconds, hence for 1 interval it is 3 seconds. Now at 10 o’clock, total strikes = 10, and total intervals = 9. Hence, for 9 intervals it will take 9 x 3 = 27 seconds. None of the options match! Hence, the question is wrong. UPSC will give bonus to everyone. Be happy! All healthy people go for morning walk. Morning walk is essential for maintaining good health. Sol. Ans (d) A classic case of jumping the gun! If “Morning walk is good for health”, it cannot mean that “All healthy people go for morning walk”. Morning walk is not the only essential requirement. Hence Conclusion 1 is wrong. Hence options (a) and (c) are wrong. Focus on Conclusion 2. The word “essential” is what makes it wrong, as that is not mentioned. Best answer is (d). 75. There are thirteen 2-digit consecutive odd numbers. If 39 is the mean of the first live such numbers, then what is the mean of all the thirteen numbers? Sol. Ans (a) Let the 13 consecutive 2-digit odd numbers be 2n+1, 2n+3 so on. (because 2n+1 = an odd number) So, for the first 5 numbers, we get [ 2n+1 + 2n+3 .... + 2n+9 ] / 5 = 39. => 2n+1 ..... + 2n+9 = 195 which gives n = 17. So the series is 35, 37, 39 onwards till 59. This series’ mean is 47 (Sum divided by 13). Answer is (a). Sol. Ans (b) The final tally of cards with each boy will be : A-8, B-7, C-12, D-15, E-11, F-7. So total sum of cards of D and E is 26. Which means F + B + C = 26 Cards. So the correct answer is (b). Sol. Ans (a) Let the weight of Mixture = 100 g. So amount of milk in mixture = 50 g, and amount of water in mixture = 50 g. We then took one-third of “this milk” i.e. 100 g mixture (= 100/3 g). That has (100/3) / 2 water, and (100/3) / 2 milk. We added 100/3 pure milk to it. So finally we have a mixture equal to – 100/3 milk + (100/6) water + (100/6) milk = 400 / 6 g mixture. So amount of Water in this final mixture= [ 100 / 6 ] / [ 400 / 6 ] = 1 / 4 = 25 %. So final percent of water in the mixture= 25%. Answer is (a). 78. There are 4 horizontal and 4 vertical lines, parallel and equidistant to one another on a board. What is the maximum number of rectangles and squares that can be formed? Sol. Ans (c) A question from the most basic of permutations and combinations. There are 4 horizontal lines and 4 vertical lines. So to make a rectangle, we have to select any 2 vertical lines and any 2 horizontal lines. That can be done in 4C2 x 4C2 ways, that is a total of 36 ways. Answer is (c). 79. A freight train left Delhi for Mumbai at an average speed of 40 km/hr. Two hours later, an express train left Delhi for Mumbai, following the freight train on a parallel track at an average speed of 60 km/hr. How far from Delhi would the express train meet the freight train? Sol. Ans (c) The distance travelled by the Freight Train in the time the second train has just started, is 2 x 40 = 80 km. Now the express train is moving with average speed 60 km/hr. So the relative speed = 20 kmph. Now it has to cover 80 km (effectively) with a relative speed of 20 kmph. That means 4 hours. Now the actual distance travelled by the express train in these 4 hours = 4 x 60 km = 240 km. Hence, answer is (c). 80. In a test, Randhir obtained more marks than the total marks obtained by Kunal and Debu. The total marks obtained by Kunal and Shankar are more than those of Randhir. Sonal obtained more marks than Shankar. Neha obtained more marks than Randhir. Who amongst them obtained highest marks? Sol. Ans (d) Data insufficient. As Neha has obtained more marks than Randhir (given) so Randhir cannot be the answer. Sonal has obtained more marks than Shankar, but her relation with Randhir is not given. Also no sufficient information is given about her relation with both Kunal and Debu. So we can come to the conclusion that Data are inadequate. Answer is (d).